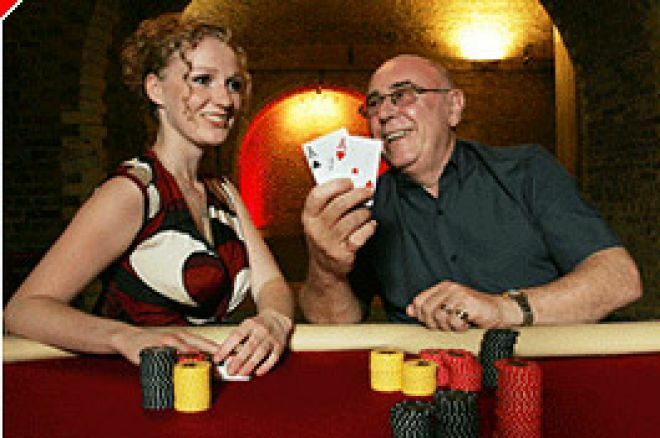 UK Poker News continues its interview with legendary poker character, Roy Houghton, who has been going strong in the UK poker scene for five decades but is far from retiring as he is about to open his brand new private members' club in the City of London, "Loose Cannon Sports Bar &amp; The VC Player's Lounge" (For contact details, click on the News tab above for our article dated Saturday 9th September). In part 1 of this interview, Roy had traced his early days in the casino and poker businesses of London and Brighton and had reached 1984, the point at which he had been asked to reopen the cardroom at the famous "Vic" after a short period of closure. He stayed there until 1988. In this part two, Roy brings us up to date and surprises us along the way with how instrumental he has been in developing aspects of the poker world we know and love today. In, I think, 1988, The Barracuda was running a £1,000 poker tournament which was unheard of in those days. Nobody ran a £250 tournament, let alone a £1,000! What happened was that they publicised this thing; they had a directors meeting and they realised they had no-one to run it! They hadn't the vaguest idea how to run a poker tournament. They approached me and asked if I would come over so I go over to the Barracuda. We were talking of generating £105,000 which was in those days massive, and that was how it all started. I worked at the Barracuda; then left the Barracuda and opened up the Lyndhurst Card Club in St John's Wood, in 1990. Started up my own business outside of the casino industry, then went back to the Barracuda to open up the card room. Did all that and then went out to Jersey for 15 months. So, generally I've been floating around for years here, there and everywhere! I ran the first Poker Million tournament with Ladbrokes on the Isle of Man; invented the Double Chance Freezeout; invented what they call the mammoth hold'em tournaments. I'm an innovator, an ideas guy; and some of them have been a disaster! For the audience, I don't want anyone thinking I don't have disasters! The odd one or two have been but a lot of them have been successful and that's it basically. I know all the old poker players. Up to about six years ago before the internet boom started, the poker community was quite small so I can say, hand on heart, I probably knew 90% of all the poker players in the UK because I used to run a poker tournament in the Isle of Man every year. All these boys would come over from Nottingham, Manchester, Newcastle and Scotland, so I got to know them. Then we started to get the internet boom and all these young kids are getting to be as good in one year as all these boys did in 30 years! They go on the internet, play three or four screens; it's like a super-fasttrack in becoming a poker player. So now, like I was told the other day, 1,700,000 Brits play poker on the internet. That's a lot of poker players! I've been playing online for six years and I can remember saying six years ago to my wife – I'll never forget it – "do you know, there's over a 1,000 players on Pokerstars!" She went "you're joking". Normally 800 players was a busy site. Now it's 70,000 to 80,000 on Pokerstars alone or Party Poker. It's unbelievable and it's not peaked yet. It's got another three or four years. Over the last eight years or so, I worked down at Russell Square, which we called the Dungeon, as it was down in the basement, the casino. It was a very popular card room. One night, a player said to me "I don't understand why you've never opened your own cardroom". I said "where am I going to get the money from? I'm a working class boy! I ain't got no money." So he said "I'll back you". I said "it's not peanuts you know, it's quite a lot of money." "Well, how much do you reckon?" I said "about £200,000". "I'll put up £100,000. Have a think". I thought he was joking, I really did. He spoke to me a couple of weeks later and said "have you thought any more about that club?" "Are you serious?" He said "100% serious, we'll open the club up". He then introduced me to another backer, a guy who had a computer business. I was introduced to him and he said "yeah I'll stick £100,000 in". Well, what actually happened was, I had these two guys and I was looking for premises, and then I got cancer, so I had to level with these blokes and say "I don't know whether I'm going to be around for much longer, I've got cancer! So, we'll call it a day, eh?" These guys were wonderful. I beat the cancer and in about a year I opened up the Gutshot Club for Derek Kelly and Barry Martin. I was there for 15 months but, no disrespect to Derek or Barry, I didn't like the way the card room was going. The guy who had the computer business, who I hadn't heard from for a couple of years, rang me and asked how it was going and what was I going to do about this card club now I was alright. So, it all flared up again there. I saw the "Loose Cannon" site fourteen months ago, the beginning of July last year. I fell in love with it and thought I've got to get this place opened. I want to be able to run a club where I have the say-so, where I don't have an over-manager over me who can kill the room or make the room. It's gone on from there. We've been negotiating for ages and ages and ages and funnily enough partners have come and gone. That partner is no longer with me and we are now at the stage in the next month of opening this place as a card room. We're going to do something totally unique, never before done which is, because we are not in the gaming area, we can't charge. You know the Gutshot were taken to Court in January for breaches of certain sections of the Gaming Act. We didn't want to do that. One of my backers said, if it's illegal at all, I won't put money in. We've spent a lot of time and trouble going to the Gaming Commission, the City of London, the City of London Police and it's all been done. In other words, we're starting a private members club, the facilities are totally free of charge, we are not taking rake or table money. We've got to change the whole mindset of poker players. You might come down to "Loose Cannon" with £200 to gamble with and if I ask you for three months subs of £90, you'll say "but that's nearly half of my money!" I've got to change that mindset but I'm positive that once poker players realise what their poker's costing them, £1.50 per day in rent, well I've got to be crazy not to do this! So, we're optimistic. It's not going to be easy to start with but I've got every confidence that this venue is going to be a huge success. The other thing, because we are in the City of London, I think we're going to get a huge amount of our membership from the people who work around here, the finance houses, the banks and so on. I'm not in competition with the Gutshot; I'm not in competition with the Vic. I'm looking for a totally new breed of poker player within the City and I think we'll get a lot of them. We will be able to offer players a lot of incentives such as plenty of elbow room and real service in one of Europe's largest cards room, four major festivals a year as well as added incentives provided by our sponsors Victor Chandler. I will open the club from the 12th of September when players can come down for registration for a free trial "Founder Membership" allowing them to experience the club and all games at no cost. I really can't wait to show it off!